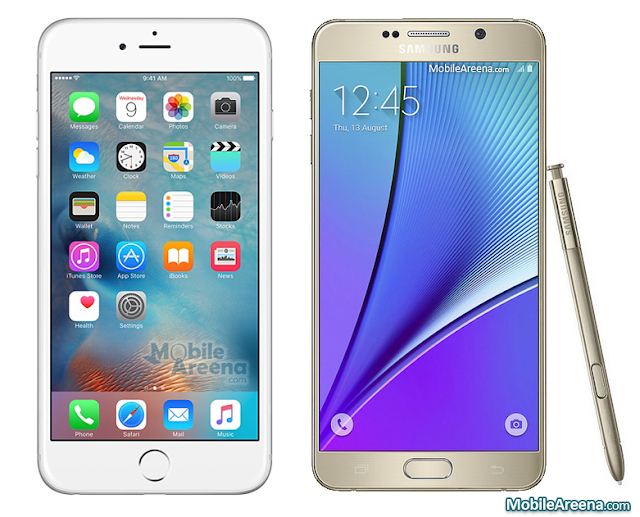 Samsung Galaxy Note5 and Apple iPhone 6S Plus are perhaps the two models about which a lot of comparisons have been made. Although both of the companies are far away from each other in terms of operating systems they use in their phones but they are direct rivals of each other. 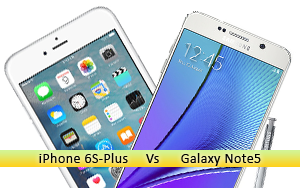 After a long study, we have brought you Final 10 reasons here that why Samsung Galaxy Note5 is better than Apple iPhone 6S-Plus. The Galaxy Note 5 is the first phone from Samsung to integrate 4GB of RAM (another phone is Galaxy S6 Edge +) and is the cell that provides greater productivity to date. Meanwhile, the iPhone 6S-Plus iss the first cellular Apple Touch integrate 3D technology (along with iPhone 6S) and is only the second cell of Apple with a camera that features optical image stabilization. (The first was the iPhone 6 Plus). Both are excellent large cell that will please many people, but there are a couple of things that make the Samsung Galaxy Note 5 to be better than the iPhone 6S Plus. The first thing is here, the cheapest iPhone 6S-Plus has only 16GB of storage, while the cheapest Samsung Galaxy Note5 has 32GB of storage. Although the price of these cellular changes, there is really a difference for iPhone 6S-Plus serve as a reason to support Samsung’s cell phone has double the storage. No doubt, the most attractive feature of Note devices is the innovative S-Pens. The S-Pen of Samsung Galaxy Note5 has clickable button that gives you a feel of real pen in your hand. It has also many new features like "Take Note on off-Screen", Scroll Capture, and a brand new Air-Command Menu. The S-Pen is really a charm and you can make most of it. Some of them are of the view that Only S-Pen of Note5 is enough to prove its uniqueness in the today's world of mobile devices. Do you want to open more than one app at a time on the same screen? The Samsung Galaxy Note 5 is ideal for this. While iOS nine first brought true multitasking features Apple’s operating system, these functions can be used only in the latest and greatest iPads; not the iPhone 6S Plus. The Galaxy Note 5 allows you to split the screen in two to create floating screens (or bubbles) multiple apps. In addition, the Galaxy Note 5 has a stylus that allows you to write more freely about the screen or be more precise in what you do. Apple introduced a stylus on the iPhone 6S event, but it only works with its new tablet: iPad Pro. Furthermore, future Android Marshmallow is said to come in USB Type C port, so the transfer of power from power bank/outlet to devices will be much faster. It is learnt that just few minutes of charging is enough for the device to run for numerous hours. While the Samsung Galaxy Note 5 has a 5.7 inch screen with a resolution of 2,560×1,440 pixels and a density of 518ppi, 6S Plus iPhone has a 5.5 inch screen with a resolution of 1,920×1,080 pixels and 401ppi density. With the Galaxy Note 5 you manage to display more content at once, without the cell is larger (later on this). Its screen was named as the best screen on a cell by DisplayMate. Generally, the logic makes us think that a device with larger screen has to be bigger, but that does not happen here. With a 5.7 inch screen, the Galaxy Note 5 is less high and wider than the iPhone 6S Plus with its 5.5 inch screen. While the Galaxy Note 5 has a height of 153.2mm and 76.1mm wide, the iPhone 6S Plus has high 158.2 and a width of 77.9mm. It is true that the iPhone 6S Plus is slightly thinner than the Galaxy Note 5 (7.3mm vs. 7.6mm), but it makes little sense for a device with a larger display with this difference size difference. In addition, the Samsung Galaxy Note 5 weighs only 171 grams, while the iPhone 6S Plus weighs 192 grams. The Samsung Galaxy Note 5 is not the first Android phone that supports wireless charging, but is the first of the Galaxy Note series that does not require an additional cover charge cell when placed on the pad without being connected to a cable. IPhone 6S Plus does not have this feature integrated wireless loaded. In addition, this wireless charging Galaxy Note 5 is not that we have probably known in advance that is relatively slow. Wireless charging the Galaxy Note 5 is so fast that even faster than other cell load when connected by cable. The battery capacity is not everything in the length of it, but it’s a very important aspect. While the Samsung Galaxy Note 5 has a 3,000mAh battery, the iPhone 6S Plus has a 2,750mAh battery. In our tests, the battery of Galaxy Note 5 managed to take 15 hours continuously playing video. 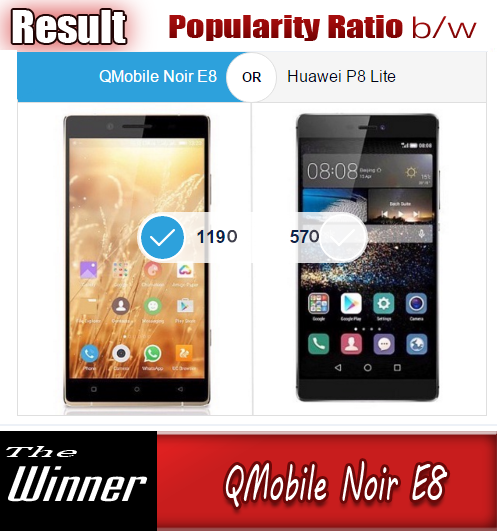 Although we have not tested it with iPhone 6S Plus, chances are you are not close to this number when you consider that its predecessor, with a higher capacity battery (2,915mAh) had 13 hours and 16 minutes in the same test – almost two hours apart. It’s not for everyone but it is better to have more than less. The camera flash Samsung Galaxy Note 5, together with other sensors, allows the cell to identify your heart rate, as well as oxygen saturation in your blood and your stress level. This feature of the Galaxy Note 5 may be a good way to identify how strong you are working in the gym and although it does not work perfectly, it’s nice to have that option. Moreover, the iPhone 6S Plus does not have a sensor that allows it to determine your heart rate, although it is possible to identify similarly with some apps you need to download. These features allows users with much more experience in customizing their phones. Samsung Pay is a new payment system of the company that not only allows payments using NFC – as Apple and Android Pay Pay (formerly Google Wallet) – but also integrates technology Segura magnetic transfer (MST, for its acronym ) that allows the user to make payments on terminals that do not have NFC, but receive credit cards. It may be that in principle it is not easy to understand, but the integration of MST gives you the potential to Samsung of your payment system could be compatible with up to 90 percent of places that accept a credit card, while Apple Pay Pay and Samsung are limited to a small percentage that reports directly to terminals having NFC. Samsung Pay is only available in the Samsung Galaxy Note 5 Edge Galaxy S6 +, Galaxy S6 and S6 Edge Galaxy. It’s no secret that the Samsung Galaxy Note iPhone 5 6S Plus are two of the most expensive phones on the market. However, the Galaxy Note 5 is priced at $ 250 US when you are shopping at two-year contract in the USA, while the iPhone 6S-Plus is priced US $ 299 US with the same contract. In Pakistan, Galaxy Note5 32GB version is available about 77,500 PKR while iPhone 6S-Plus 16 GB version will set you back 95,000 PKR. Someone can say that it is a small difference, but it is really important when you think that for that price you are paying over half storage Galaxy Note5. Remember, the iPhone 6S Plus with the starting price has only 16GB of storage, while the Galaxy Note 5 has 32GB. In short, you pay more and get less storage in case of iPhone 6S-Plus.